Let's be honest, the Book of Order is not always the most enticing read. The acronym, B.O.O., is a self-fulfilling prophecy, scaring away lay readers all over the country. Maybe it's because when we think of the foundation, purpose, and function of Part II of our denomination's constitution, the mission of God in Christ is not what immediately comes to mind? Maybe it's also because marginal congregations and/or Presbyteries have provided space to wrestle with related leadership paradigms and contemplated what it means to innovate new expressions of the church while maintaining a fidelity to our tradition and the One who is sovereign over all? The Book of Order can be a daunting and deadly book. The Book of Order can also be a platform and resource for innovative, faithful, and sustainable mission. 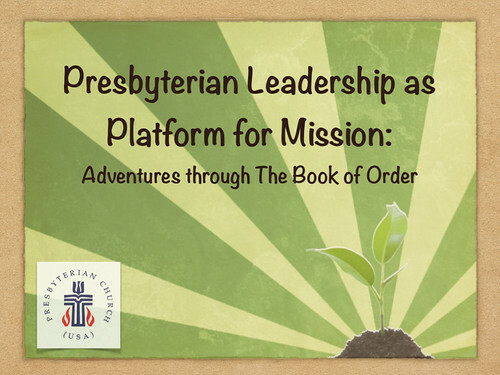 Throughout the month of June, a group from our congregation will be working through a playful practicum I developed, Presbyterian Leadership as Platform for Mission. This course not only serves as a final capstone to my ordination requirements, but also is a means to revamp vehicles of preparation for those called to serve within the ordered ministries of elder and deacon. The first week's goal, reclaim the mission of God in Christ as the focal point of all our forms, structures, and governing patterns. Yes, PCUSA polity is deeply missional in nature. How easy it would be to assume the above statement as from the pages of a seminary textbook written by the likes of Darrell Guder or John Franke. Yet this comes from the opening lines of Part II of the PCUSA Constitution. The church is about God's mission in Christ. We are participants in that mission. I wonder what can happen when we reframe the remainder of BOO, despite its frightening acronym, as an invitation to playful yet faithful, creative yet accountable, risky yet relational participation in God's dreams for the world? What can happen when we engage the outlined vision and definition of ordained positions in ordered ministries so that those in leadership can reclaim their missional vocation? I am not sure, yet I am deeply hopeful. 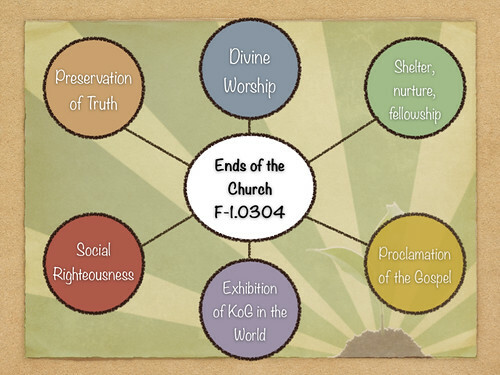 I have fallen in love with the language and structure of the PCUSA Book of Order, which is good given my calling. Yet I pray the love for such language does not transform into frivolous idolatry of stagnant systems. Instead, may the Book of Order bring life and movement to a church called not only to reformations in theological convictions, but also in our beloved institutional and ecclesial structures. May we do so as disciples of Jesus, reminded that we are but a provisional demonstration, versus sovereign and eternal entity, of what God intends for the whole world. * The goal is not an eternal church. Instead, the church paves the way forward with radical incarnations of the kingdom until the day comes when there will no longer be a need for a church, for God will make God's home among all people's (Revelation 21). The Book of Order can help us do just that. When it does not, we will need yet another revision. *I love the old language from earlier edition of BOO, "The Church of Jesus Christ is the provisional demonstration of what God intends for all of humanity." (G-3.0103). Provisional is defined, arranged or existing in the present, possibly to be changed later.